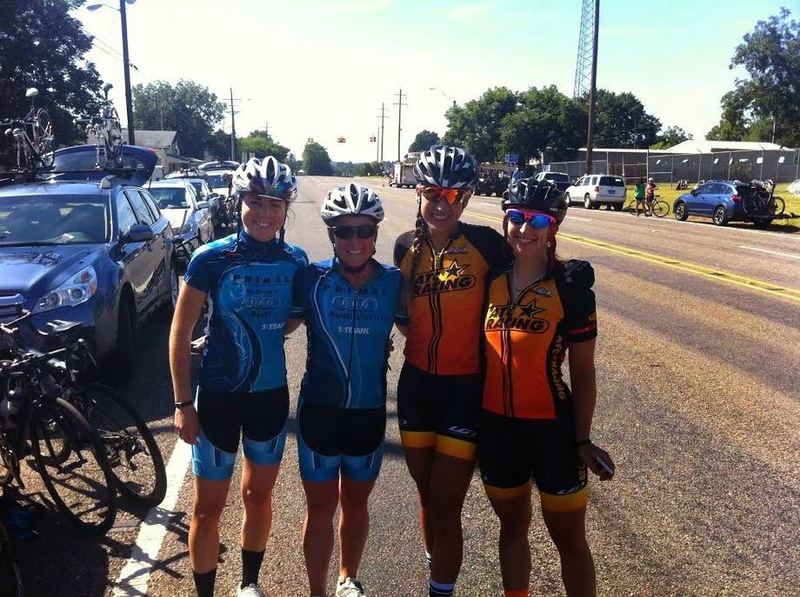 The Coleman Chevrolet Stage Race, put on by Edge City Cycling near Texarkana—right on the border of, you guessed it, Texas and Arkansas—is far from home and late in the season, but this stage race is well worth the drive, especially for the women. The women's open payout (when the field size meets the minimum) matches that of the P12 men! Our ATC correspondents reported having unseasonably cool weather and a great time. Read on for a play-by-play of the three-day event from ATC Racing's Allison Atkinson. 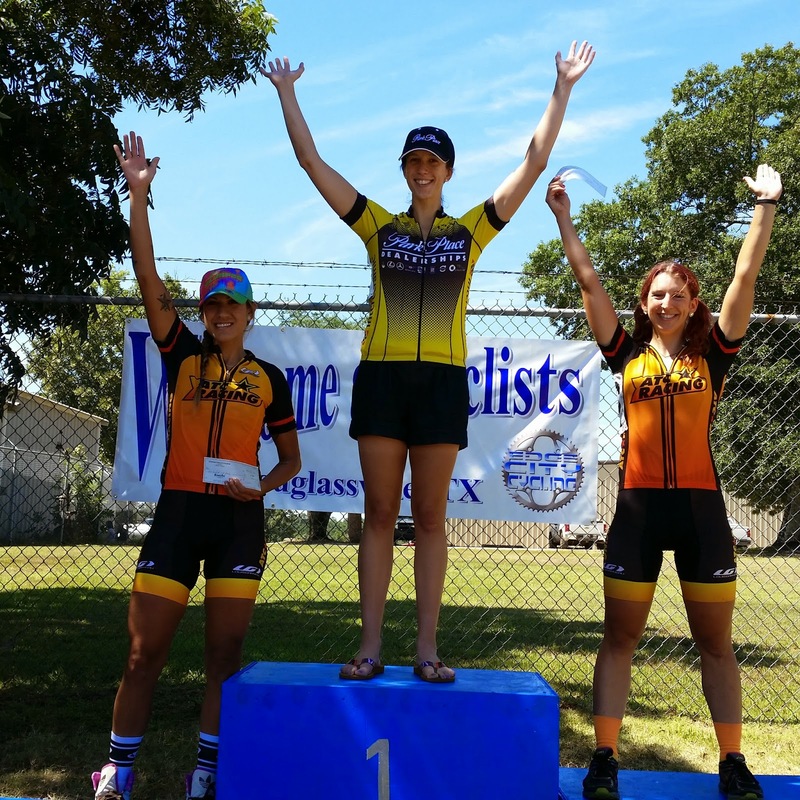 Katie Kantzes and I were not sure if driving five hours up to Texarkana for a stage race would be worth it, especially with only 10 signed up in the women's field, four of which were from Dallas Racing. Well, the drive up actually took us eight hours, and we still aren't sure why. Even with the longer drive, we decided that WE would make the race worthwhile and showcase a little of what makes ATC Racing special. In short, we would bring the party AND the pain to Texarkana! And yes, it was totally worth it! Day one (60 mile road race) was cold (in the 60s) and drizzly. I could not believe that I was racing in arm warmers and truly felt like I could catch cold out there. Lap one was an awkward dance. Smaller field sizes resulted in combining the women 3/4's, Women Open, and Men 60+. The men took responsibility early on, setting a great tempo. The men also, however, greatly changed the dynamic of the first 30 miles. One of them would get into a break with the women, which caused a chain reaction of competitive men chasing, pulling the group up to the break. Who knows if the breaks (all of which Katie or myself were in) would've stuck had a man not been in the mix? Our Women's Open group awkwardly let the Women 3/4's and men (who only raced one lap) go ahead and sprint to finish. We continued at a steady pace starting lap two. We ate and talked, which made me nervous. I don't like making small talk in general, much less mid-race. I became annoyed but kept my guard up while trying to eat and drink. Attacks would certainly come from Dallas Racing and the two Team Primal Racing riders from Denver. Andrea Thomas (Dallas Racing) attacked on the first sizable hill. Katie and I looked at each other. I spit out whatever I was eating and yelled "We gotta go NOW!" We took off, and I used my momentum to pull for a while on the flat. Andrea was in sight. Getting out of the saddle on the next hill, I kept the chase pace strong till Katie came around and up the hill to Andrea. Solymar Rivera (Dallas Racing) countered, and we chased. This continued till confusion set in on a mismarked turn. I happened to drift to the back of the pack approaching the turn because I thought the sign (pointing straight) was supposed to point right. All the women went straight except for Andrea, who took the right turn hot and then attacked. I scanned the road ahead and saw everyone turning around. I decided to chase Andrea, who was already up the road quite a ways. I bridged and worked with Andrea for about five miles before we were caught. It was the efforts of the Team Primal Racing women that shut it down. Team Primal Racing kept the pressure on in the final 10 miles with attack after attack, but nothing stood a chance of staying away without a Dallas or ATC lady in the mix. Solymar tried to get away early leading up the finish. Katie and I didn't let that happen. Approaching the base of the uphill sprint Andrea attacked early, launching Solymar, Katie, and me into a first, second, and third place finish. The TT was just under five miles of rollers. Katie looked a like a fish out of water warming up on her borrowed TT bike. 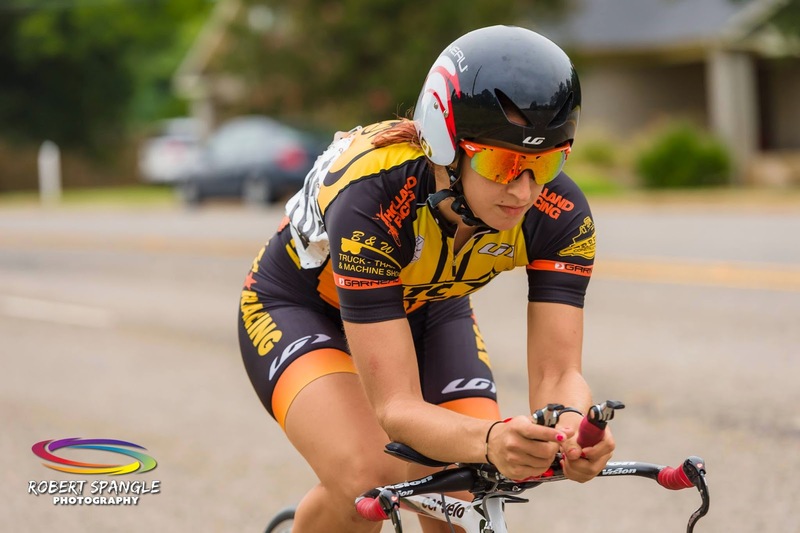 It was the first time she'd ridden a TT bike in her life, but, as our team's supporters suspected, it was better to force her to race it knowing she has the makings of a great time trialist (even though she was a little sketch). Our suspicions were correct! She placed second! Andrea was first, and I was, again, third. GC was greatly affected by the TT because Solymar finished lower than expected. Now we would really have to watch Andrea, who was first in GC by a slim margin. I still had to watch Solymar because she could try and get into a break to get time on me for third GC. Day two (50 mile road race) felt just as cold in the morning but quickly warmed up to the 80s when the sun came out. Our goal was to get on the podium and win the Team competition, which we were already leading. We were combined again with the same faces, and this time the men raced the full distance with us. With centerline rules in place it was hard to maneuver around, so I had to be at or toward the front to avoid being boxed in should something get up the road. The men took on a lot of the responsibility, setting a good pace early. Katie and I sat in; nothing really happened till we hit a series of stair-step climbs. I believe a 3/4 woman started trying to ride away, which caused a weird chase because the men (whose wheels I followed) didn't care and sat up. This led to a jumble of men sitting up in the climbs, 3/4 women blowing up in pursuit, and 1/2 women trying to maintain a good position. I looked over at Katie, who seemed annoyed or bored or both. There was a pretty long climb ahead, and it was still the first lap for us, but Katie found her way out of the tangled mess and just started climbing at her own pace. It wasn't an attack, just a quicker climbing pace that allowed her to ride away. Andrea saw this and had to work for a few moments to get around some tired climbers, but she managed to bridge up to Katie. Solymar and I looked at each other. Our GC leaders just formed a break only 15 miles or so into the race. What now? The two Team Primal riders worked their way to the front, where I sat on their wheels as they fiercely chased. The pair worked well together till we found ourselves on another long climb. One of them rode away, and I stayed with her with Solymar in tow. Solymar attacked, I chased, and the three of us stayed together till we were caught. I knew that I had to watch Solymar. I talked with the Team Primal ladies, who were upset that they had to chase completely alone. They really wanted to break away with me at five miles to go. I refused because I knew Solymar would come with us, and I didn't want to stir things up too early. I asked if they'd help me keep the pace fast at 1k to go to string things out. Eager to help, they did just that after rotating with me at a mile or so to go. I finished fourth, Solymar was third, and Andrea pulled off first with Katie second. Overall we were pleased with the day's efforts and happy that we'd reached our goals. I felt like the small field made for a harder race. I honestly hadn't had the opportunity to race that hard or feel THAT tired in a while. Katie and I got a good feel for how to work together and discovered we make a great team! The courses (especially day two) were hillier than expected. It was a great weekend, and the best part was I GOT TO WEAR MY OFFICIAL SLURPEE HAT ON THE PODIUM! I will definitely race next year and hope to see bigger fields then—ATC will bring the party and pain again to the women's field! Back in June 2013, Dallas-based software company Best Bike Split quietly launched a groundbreaking new website, one that replaces the guesswork and superstition so inherent to time trialing with real data and real math. 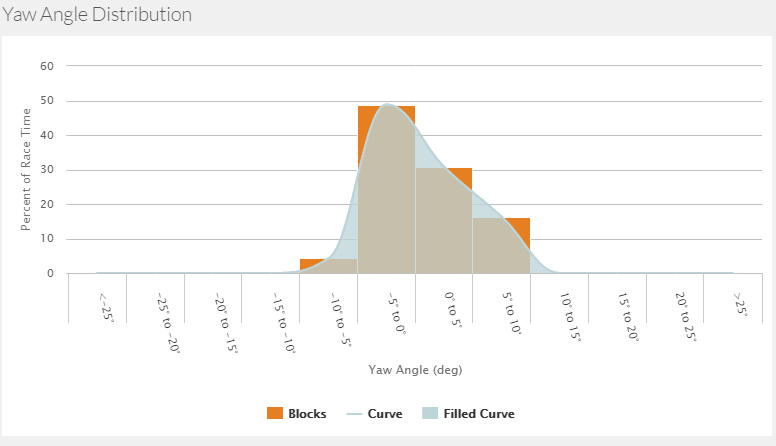 Taking inputs about the individual rider, bike, course, and weather conditions, the tool allows a user to predict finish times, optimize pacing plans, and make intelligent equipment selections. The data nerd can enter every last thing, from CdA to rolling resistance, but for the novice or less detail-oriented athlete, the software can also make intelligent guesses on many unknown minutiae. 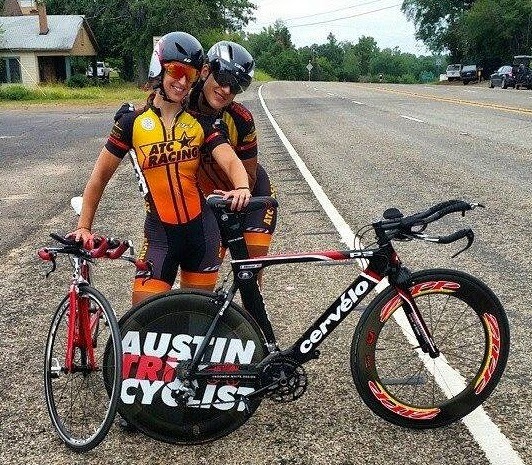 BBS has been used with great success by various local Austin professionals and top amateurs, including pro triathlete Kelly Williamson, 787 Racing's Steve Guzman, and ATC Racing's Kat Hunter, and the site continues to improve, offering new features regularly. Most people know that you need to go a little harder uphill and a little easier downhill to go as fast as possible for a given effort, but exactly how much to vary your power can be tricky to determine. BBS does the math for you to give you an exact answer. You can use the resulting pacing data in a number of ways: simply review it to get a high-level idea of how to vary your pace on key climbs, download the pacing plan to select GPS devices so that you have a second-by-second power goal as you race, or use BBS to output a simplified "cheat sheet" that you can memorize or tape on your top tube. If you have a goal time for your bike leg, like a sub hour 40k TT or 5-hour Ironman bike split, you can use the BBS goal time model to tell you what power you will have to generate on a given course to achieve it. Conversely, if you are trying to decide on a goal power for your event, you can use the regular pacing model to see what time will result at each power level. For example, is it worth the risk to try going 20 watts harder in your triathlon than last year? Find out exactly how much time it will save before you decide. Challenging bike courses with lots of hills often leave athletes wondering if they should use a road bike instead of a TT bike, or light wheels instead of aero wheels. With BBS you can set up bike profiles for various options and do the math to fairly definitively decide which option is really best. A great example of this being put to use is the Flo Cycling weight vs aero study. True aeroweenies can dig even deeper using the yaw distribution feature. This will give you data on the time you will spend at each yaw angle on course. Since the benefit of some equipment choices such as tire and wheel width depends on the yaw angle of the wind, you can use this to shave off seconds nobody else would even think about. The Wind Tunnel Model is an upcoming feature that will estimate your overall aerodynamic drag by analyzing your past performances. This will allow you to compare test sessions or races with different equipment or positions to see if you have managed to reduce your aero drag or rolling resistance. BBS uses well-established cycling physics to make its computations. If provided with accurate input for the rider, course, and atmospheric conditions, it will produce very accurate output. Many amateurs have reported spooky accuracy even when using estimates for some inputs, such as their aero drag. BBS also features a few case studies on their website. BBS has free, premium, and coaching memberships available. Premium membership unlocks unlimited bike profiles, unlimited course plan downloads, and advanced features. Coaching memberships allow you to keep profiles on all of your clients. BBS also offers a pro-level analysis service, providing personal attention to ensure the accuracy of course and rider input, as well as increased processing power for more accurate course modeling, if necessary. Pricing plans are detailed here. Best Bike Split was co-founded by Ryan Cooper and Rich Harpel in June 2013 as an offshoot of their first company together, Optimized Training Labs, which uses advanced mathematics to create training plans for triathletes and runners. Ryan is a Ph.D. mathematician who specializes in optimization mathematics, while Rich’s background is in design and web development. The two met in Dallas while training for the 2006 Ironman Coeur d’Alene. Best Bike Split’s goal is to be the standard for predictive race modeling and analysis for triathletes and time-trialists racing with power meters. Some Austin group rides have been around for more than 30 years; others peter out after half a season. The ride info below has been verified as of August 31, 2014, but if in doubt, especially after daylight savings time has ended, check in with the ride organizer. This year we've included website links when available. If you notice a ride we're missing, we'd very much appreciate your help to add it; email Kat at kat@kathrynhunter.net. Road bikes are recommended for all rides included below unless otherwise noted. "Time" is usually wheels down - it's always a good idea to show up 10 to 15 minutes early. And last but not least, these are unsanctioned rides on open roads; you're responsible for your own safety. Click the links below to search by difficulty level or click "View By Day of Week" to see a list of rides for a particular day. A social ride led by elite cyclist and coach Stefan Rothe, this Monday evening option is open to anyone on a road bike. The route changes every week, going out east toward McKinney Falls and the Tuesday Nighter course, north along Shoal Creek, or south to 5th street or to Buda if time allows. Ride time is typically 1.5-2 hours max. Start time changes with the season, so email Stefan if in doubt. You can also check ride info at http://www.austintricyclist.com/articles/rides-and-events-pg37.htm. Start ATC downtown, 923 Barton Springs Rd. Hosted by the Bicycle Sports Shop Research Blvd location, this is a good ride for new cyclists or those wanting to ease back into the saddle. Learn about group riding on a 15-mile, 60-90 minute ride along bike lanes and neighborhood streets. The route consists of mostly flat roads, with some hills to learn about shifting and cadence. This ride is no drop and makes frequent stops. Check http://bicyclesportshop.com/events/road-pg1768.htm for current info. Start Bicycle Sports Shop, 10947 Research Blvd. This 17-18 mph ride led by Mellow Johnny’s takes you through neighborhoods and official bike routes for the most part, with minimal travel on large roadways and just a few hills and optional sprint points. This group is very social, usually hanging out for coffee and snacks before and after the ride. Check http://www.mellowjohnnys.com/news- and-events/ for current info. Hosted by the Bicycle Sports Shop Parmer location, this ride offers two options: a faster-paced 35-mile ride for intermediate-level riders, or a more relaxed 24-mile ride for beginner/intermediate riders. The route is a straight out and back on Parmer Lane, so you can turn back whenever you'd like. Start Bicycle Sport Shop, 9900 W. Parmer Ln. Great for cyclists new to riding or commuting, or for those just looking for a casual spin, this ride aids participants in navigating through the city and learning safe bike commuting options. Two groups are offered: 1) riders who can average 12 mph for 15-25 miles with one or two regrouping points, and 2) riders who can average 14-16 mph for 20-30 miles, with an extended mileage option. Routes vary weekly, going through Clarksville, Rollingwood, McKinney Falls, South Austin, East Austin, and more. Scout-a-Route is no-drop and is co-hosted by MJ's and the Austin Cycling Association. Check http://www.mellowjohnnys.com/news-and-events/ for current info. Hosted by the Bicycle Sports Shop Lamar location, this ride is a no-drop ride for 18+ adults (16-17 allowed with parental supervision). You must be on a hybrid or road bike; no trikes or recumbents allowed. Bring your helmet and flat repair kit. Average speed is 10-12 mph. An intermediate ride starts at the same time. Check http://bicyclesportshop.com/events/road-pg1768.htm for current info. Always following the same route (see map info below), this ride meets Monday and Wednesday nights between April and late September. Although it can be described as “moderate,” the ride gets progressively harder as the summer wears on. Riders regroup at Parliament. Lights required! Check http://www.neloscycles.com/shop-ride.html for current info. This ride, led by the women’s racing team River City Market Racing, meets at 7am for coffee at The Coffee Bean & Tea Leaf on Lamar. Roll out is at 7:15am. The route varies, but always hits the hills west of town for a 25-30 mile hard workout. Though the ride isn’t “no drop,” they regroup at the top of each big hill and recover between. Men and women riders welcome. Meeting at Mellow Johnny’s every Tuesday and Thursday morning and led by a member of the Violet Crown cycling club, this ride is ideal for the intermediate-level cyclist. Expect a steady tempo ride with an average pace of 16-18 mph. Experience riding in a group is a must. Check http://www.mellowjohnnys.com/news-and-events/ for current info. Time Tuesday & Thursday, 7 a.m.
Rolling out from the heart of Lakeway during Daylight Savings Time, the Lake Travis Tuesday Nighter offers a little quality suffering for the work-week. The ride, led by the Lake Travis Cycling Club, usually has a group of 10-20 riders and is moderate to hard, with an average speed somewhere around 18-22 mph. The warm-up lasts the first five miles down 620 to the turn onto Bee Cave Road, and then the peloton separates into unofficial "A" and "B" groups until the turnaround at the Knollwood Loop just before Hwy 360, where the ride regroups again. (See below for the route map.) After the ride, everyone pitches in and enjoys some brews. 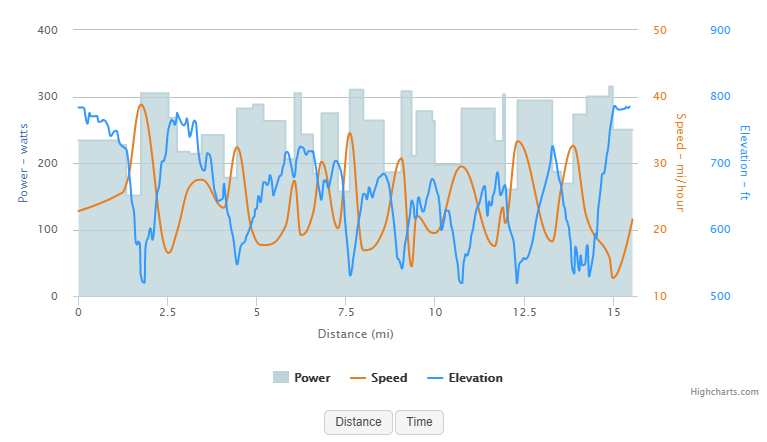 This 16-18 mile ride takes Spicewood Springs, averaging 14-16 mph. You must be on a road or tri bike. A helmet and lights are required, no exceptions. Check http://bicyclesportshop.com/events/road-pg1768.htm for current info. Time Tuesday, 7 p.m. - 8:30 p.m. This no-drop ride takes you around town: east toward Mueller, north toward Shoal Creek, and then back downtown via Tarrytown and Pease Park, with one rest stop at the Mosaic market in Mueller. Expect some flats, short hills, and a few optional sprint points. You'll need to be comfortable with urban riding and obeying traffic laws. Bring a helmet and lights. Check http://www.mellowjohnnys.com/news-and-events/ for current info. Gruppo VOP, formed 15 years ago, is an informal association of cyclists that welcomes all riders. The Friday ride is a 28-mile loop going from Westlake out Bee Caves Rd, down River Hills Rd, and up through Seven Oaks back to Bee Caves Road and the Bee Cave City limit sign. Some riders skip the river valley and go to the Barton Creek West entrance for a 19-mile loop. See http://www.bradhoustonlaw.com/gruppo-vop/ for more info. Led by the Violet Crown cycling club, this ride usually ends with a celebratory bagel and coffee. The ride starts at the Einstein Bros Bagels on Parmer/North I-35. One group completes 50-60 miles, and another travels 70-80 miles. Starting on South Lamar at bike shop Cycle Progression, the group rides a casual/medium pace to San Marcos and back. The mileage is generally 60-75 miles and is led by the Cycle Progression team. Check in once the time changes, as they may move to a 9 a.m. start. On this intermediate-level, 30-40 mile ride, the front group averages 17-20 mph, and a second group averages 15-16 mph. All participants start together in a large group of 50+ people and naturally split into the intermediate and advanced groups. Routes may vary, but current website info lists the "Happy Buda route." Check http://www.mellowjohnnys.com/news-and-events/ for the latest details. Gruppo VOP, formed 14 years ago, is an informal association of cyclists that welcomes all riders. The Sunday ride, ideal as an introduction to VOP, is a 27-mile recovery ride that heads south from Westlake to South Mopac/45 and FM 1826, coming back Slaughter Lane to Mopac. It’s the most social of the VOP rides and typically ends by 9:45-9:50 a.m. See http://www.bradhoustonlaw.com/gruppo-vop/ for more info. Hosted by the Bicycle Sports Shop Lamar location, this ride features a different route in south and west Austin each week. Average speed is 14-16 mph (including hills). You must be on a road or tri bike. A beginner ride starts at the same time. Check http://bicyclesportshop.com/events/road-pg1768.htm for current info. Reputed to be one of the oldest group rides in Austin, this group has been meeting every Sunday morning for more than 30 years. Average pace is 17-18 mph for 50-60 miles, and there are some rest points, but if you get dropped, you’re usually on your own. The ride is well suited for an intermediate rider on a road bike accustomed to riding in groups. Check http://www.mellowjohnnys.com/news-and-events/ for current info. A recovery ride led by the Boneshaker/Div 1 team and Division 1 staff, the Div 1 ride leaves from the bike shop on East 7th and heads out to Manor. The average pace is 17 mph, and all bikes are welcome. Attendance varies but is usually around 15-20 riders. The bike shop also doubles as coffee house - say yes to the pre-ride espresso! Gruppo VOP, formed 14 years ago, is an informal association of cyclists that welcomes all riders. The Monday ride is a fast-paced, 32-mile loop that heads south from the Westlake area. Very important: Sometimes the start time and place for the Monday ride varies slightly, so for this ride, email Brad a few days in advance so that the riders know you’re joining them. See http://www.bradhoustonlaw.com/gruppo-vop/ for more info. Gruppo VOP, formed 14 years ago, is an informal association of cyclists that welcomes all riders. This very popular, very challenging Wednesday ride is a race-paced, 28-mile loop that goes out and back on Southwest Pkway to Barton Creek Blvd and Bee Cave Road, then through the neighborhoods in Lost Creek. You’re guaranteed to get in some hard efforts and brutal hills. Be prepared for three highly coveted sprint points. Gruppo VOP, formed 14 years ago, is an informal association of cyclists that welcomes all riders. The Saturday ride offers ride options of 26, 45, or 52 miles. Like the Gruppo VOP Wednesday Ride, this ride often feels like a race, with multiple sprint points and a consistently high pace. The longer loops follow Wednesday’s route and then continue up Hwy 620 to River Place or Anderson Mill Road. Some riders add on Lime Creek. The short ride usually travels back along Bee Caves Rd from the intersection of Hwy 620 and Bee Caves Rd. See http://www.bradhoustonlaw.com/gruppo- vop/ for more info. If there's not a road race going on the same weekend, this cutthroat ride is popular with a fast crowd. There aren't sprint points, per se -- everyone just rides like there's one every quarter mile. The route twists through far southeast Austin's farm country, with a quick refueling stop at mile 35. You'll get left behind if you drag your feet, and the group doesn't always stop for mechanicals. Check http://www.mellowjohnnys.com/news-and-events/ for current info. All masochists are welcome, whether dedicated roadie, fixie rider, mountain biker, or whatever-else-on-two-wheels, on this informal Monday-night hammerfest. The group meets at the Pflugerville Pedestrian Bridge. Lights and helmets required. Beer money recommended for after. Not for the weak of heart, this event has been tearing down farm roads in Southeast Austin at 25-30 mph for what some regulars estimate to be 25 to 30 years. However, the addition of neighborhoods and two stop signs on the course has slowed things down a bit. The ride currently completes three 9-mile laps, with an unofficial “A group” and “B group” determined by who can hang on in the first few miles. The ride is free, and there’s no marked course, no support, no prizes, no judges, and no category system, but by most accounts, it's very much a race. This ride is a classic in Austin, regularly hosting elite-level and professional triathletes and road cyclists. If you're trying to "A pack" it, most weeks the pace is very fast. The pro: no one will ever chide you for attacking or pushing the pace. The con: you will probably get dropped. The directions are simple, though, and numerous splinter groups form off the back. The ride starts with a warm-up down Barton Springs and the Mopac feeder. After the right turn onto Southwest Parkway, the pace picks up, continuing at top speed through the right turn onto Hwy 71 until the sprint point at the Bee Caves city limit sign. The group often pauses at the cleaners at Hwy 71/Bee Caves. Some people head home from there via Bee Caves for the short loop and others continue on the dam loop, with the possible addition of Lime Creek. This is one of the few group rides that welcomes tri bikes and aero bars—just be sure to stay out of them when you’re in the pack. A very casual, ladies-only ride, Bikin’ Betties welcomes beginning cyclists. The distance traveled is from 8 to 20 miles, always ending at a bar, restaurant, or coffee shop for post-ride refreshment. Since rides vary widely in intensity and distance, check the event details on their Facebook site. Welcoming intermediate/advanced level women cyclists, this ride averages 14-16 mph, including hills, for 15-20 miles. Meet at the shop at 6:15. You must be on a road or tri bike. A helmet and lights are required, no exceptions. Check http://bicyclesportshop.com/events/road-pg1768.htm for current info. Start Bicycle Sport Shop, 517 South Lamar Blvd. Time Tuesday, 6:30 p.m. - 8 p.m. Led by the Austin Flyers Women’s Cycling Club, this intermediate, women-only ride averages 15-16 mph, with varying routes. The pace and the people are friendly. Check http://www.mellowjohnnys.com/news-and-events/ for current info.